Is it just me or did Easter sneak up on us this year? I feel like it was just Christmas. Normally, we’ve done a few decoupage crafts, decorated eggs, and made some spring window clings by now. My youngest is allergic to cats and dogs. However, she was born with a nurturer’s soul. Her current obsession is bunnies. She wants an angora rabbit with every fiber of her being. But, I am not convinced that she can take care of one or that she isn’t allergic to them. But, she loves all things bunny and since it’s spring and bunnies are everywhere, I get to hear her arguments on why she needs an angora almost every hour. She has bunny sweaters, pajamas, stuffed bunnies–you name it. Take a dry foam brush. 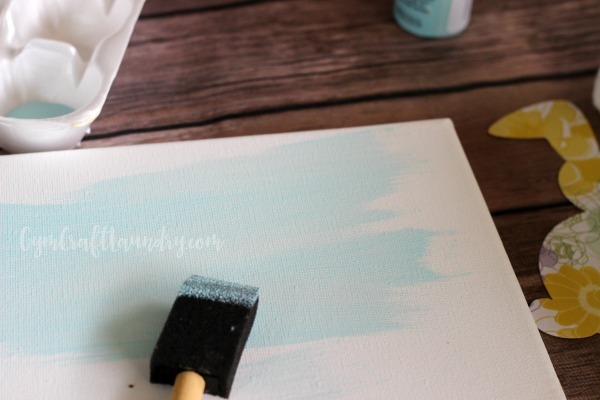 Dip in the acrylic paint and lightly paint the canvas using horizontal strokes. We wanted a dry brushed, light background so did not care that the white from the canvas could be seen in the strokes. This method also means that the paint dries in minutes. 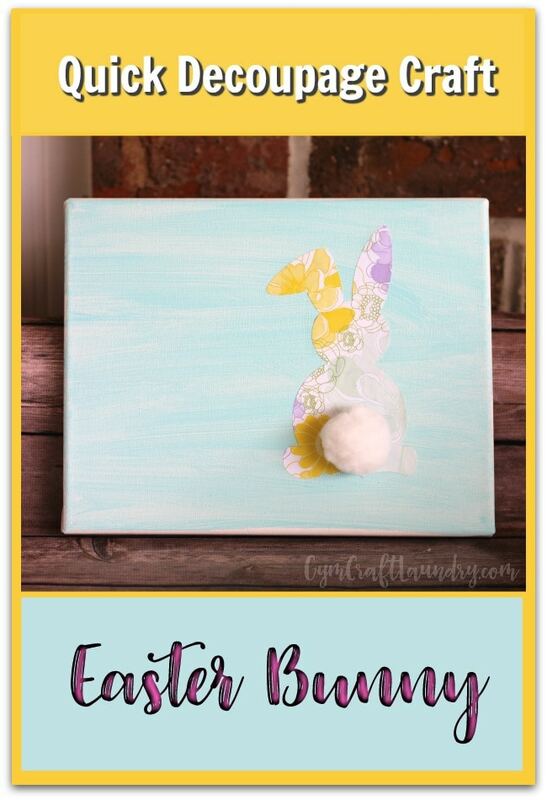 Use a cutting machine or scissors to cut out the bunny shape while the painted canvas dries. If using scissors, it may be easier to cut out the shape on card stock to use as a template. Place the bunny, glue side down and use glue to attach the pom pom. You are done. How quick was this cute project?? 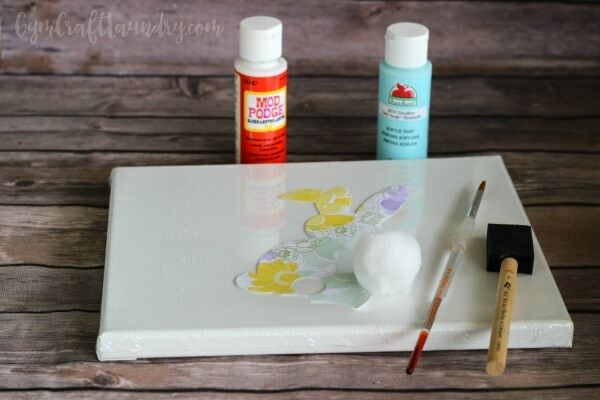 This adorable and easy decoupage idea would be fun in an Easter Basket for a Crafty Girl! Check out this cute bunny project on Ruffles and Rainboots! It was my inspiration. 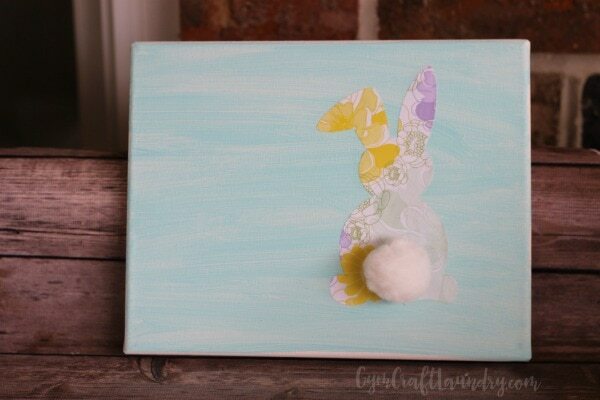 You might also like this Easter Bunny burlap canvas wall art tutorial. 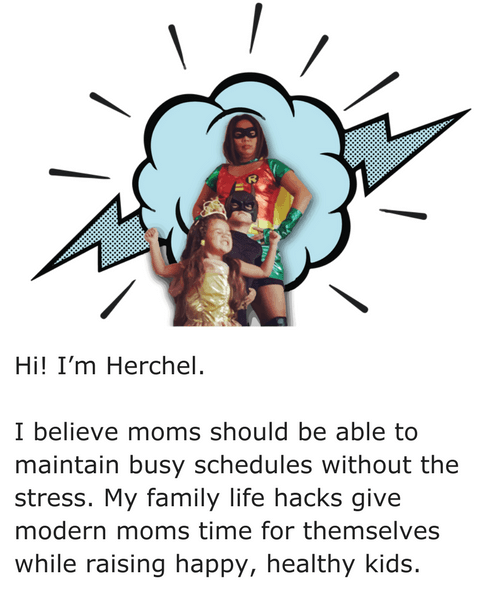 It’s also quick!